This work including original photographs may be transmitted or stored in electronic form on any computer attached to the Internet or World Wide Web so long as credit is given to liseed.org and is included in the copy. Individuals may make single copies for their own use. All other rights are reserved. Round Zucchini have been popular in Europe for years. The Italians have their dark green Tondo di Piacenza, the French have the light green speckled Ronde de Nice, the Dutch have the "Roly Poly" (a loose translation from Burpee's marketers) and the British have their single serve striped marrow, Tender and True. 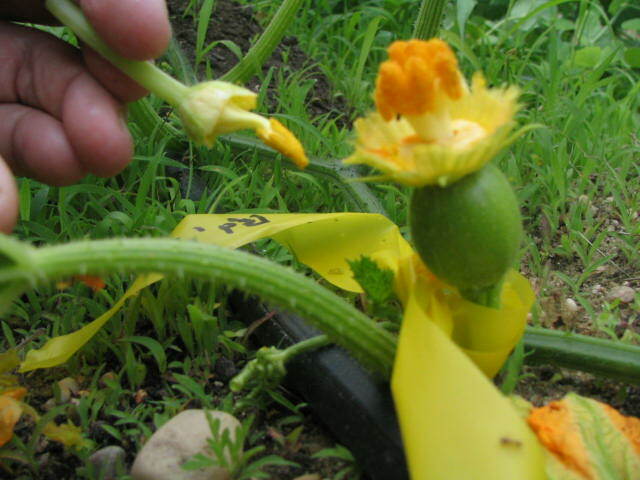 There is even chinese produced seed of an almost white round zucchini. The common thread is that these zucchini are actually rather nice; solid, nutty, sweet, and as a bonus they are extremely early producers and are prolific if you keep harvesting the fruit. The compact plants are real workhorses of efficiency. They laughed at the limited nutrients and water of our sand lot trials! Select the non hybrid types or if you want to check out the pedigree of the hybrids, save seed of those too. This year we made crosses within the same cultivar simply by "selfing" the female flower with pollen from a male on the same plant or "sibbing" another plant of the same variety and we also made crosses between hybrids and similar open-pollined varieties to preserve as many of the hybrid's characteristics and develop a variety that performs well for us and that we're able to save the seed of from year to year. It may take a few years or generations of selecting the plants with the characteristics you like but eventually you can develop an open-pollinated variety that breeds true and has the characteristics that you want. Long Island Seed's new summer squash, "Orbit"
This blend of round and near round types that we have marketed to chefs and specialty produce stores on the East End of Long Island. We can't produce enough to keep up with the demand since our primary work on Flanders Bay Farm is breeding sustainable varieties and then offering the seed to the local organic farming community. Our blend has a working name "Orbit" and consist of stabilized lines in all zucchini colors from yellow and silver to dark green and bicolors, all meant to be used in the baby (2-3") stage. We hear customers exclaim, "they're so cute". We started working on the varieties that comprise the mix several years ago (actually in the 1980's) and recently added some odder shapes to the mix. It is a sustainable mix. All we have to do (and you too, if you choose to save the seed) is make sure to self-pollinate the specific kinds to maintain type. Some new developments include an open pollinated bicolor developed from Hollar's One Ball and some of the genetics from "Lemon" an old time yellow squash from Baker Creek Seeds and a very productive modern yellow hybrid, Papaya Pear. Squash are monoecious (one plant bears both male and female flowers). In the upper photo I am using the male flower (with it's corolla removed) as a paint brush. I will transfer the pollen from the yellow anthers to the female stigmas. The female blossom also has it's corolla removed. You can see that the stigmas are attached to the ovary or yound fruit. I use survey tape to tie around the hand pollinated blossom and write down the parents (such as Eight Ball F1 x Tender and True) or if I use a blossom from the same plant I write "self" indicating that it was pollinated by itself or "same" if it was sibbed (crossed with a sibling). Insects work squash flowers transferring pollen among zucchini and any other squash that they have access to on their foraging sprees. 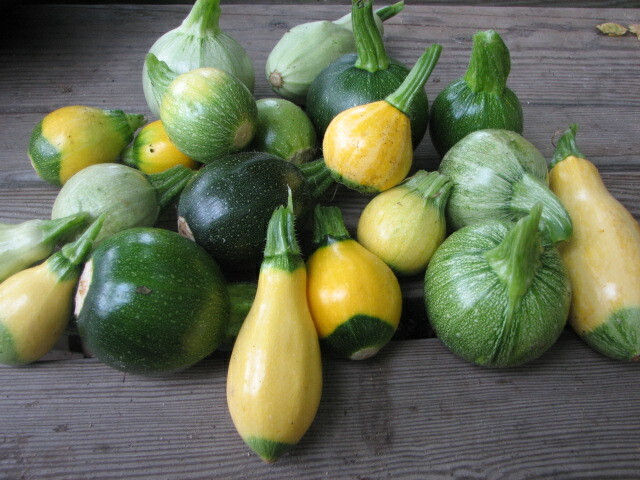 Zucchini types (all shapes) can cross with each other as well as patti pans, yellow summer squash like crooknecks, many jack-o-lantern type pumpkins, spaghetti squash, acorn squash, delicata squash and some others. I like genetic diversity but I also like to eat zucchinis that aren't stringy or taste like a pumpkin and often, if I have a rare variety, I want to preserve it's purity, so I will make a major effort to prevent insect pollination (more on that later). If I am just raising zucchini and I don't mind if they cross then you can let the bees do their work and not be concerned about making hand crosses. Of course, if you're not saving seed- let them all cross, it won't affect this years fruit. One of the top producers of squash seed in the U.S. is a wholesale seed company known as Hollar Seeds. They have produced seed of a delightful open-pollinated round zucchini known simply as Round Zucchini. Great as a mini vegetable harvested the size of a golf ball, nice for stuffing when it's the size of a softball. Recently they've concentrated on developing a trio of hybrid round zucchini, a yellow one named 'One Ball', a dark green named 'Eight Ball' which won an AAS award and a solid light green one named 'Geode'. While the dark green and light green varieties are similar to available open-pollinated kinds, the yellow one is of real interest. I'd recommend growing all three of the Hollar squash hybrids for your farmstand and figure on picking one or two fruit from each plant each week. Market the billiard ball sized zucchini together in a large display basket and keep picking them young so they will continue to produce. Over the year we've grown all of the Hollar round squashes we could find and as many of the other round zucchini. People appreciate a zucchini alternative. They're fun to grow and a good cash crop since they're considered by many of our visitors as a gourmet item. 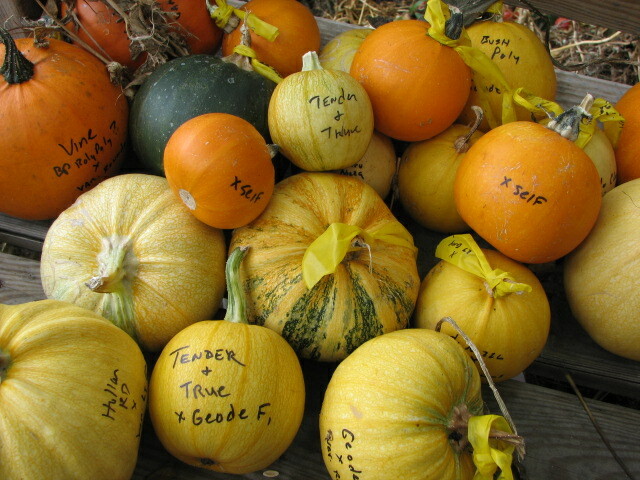 The Hollar varieties are available at many retail seed outlets. Check the pages of your favorite seed catalog. 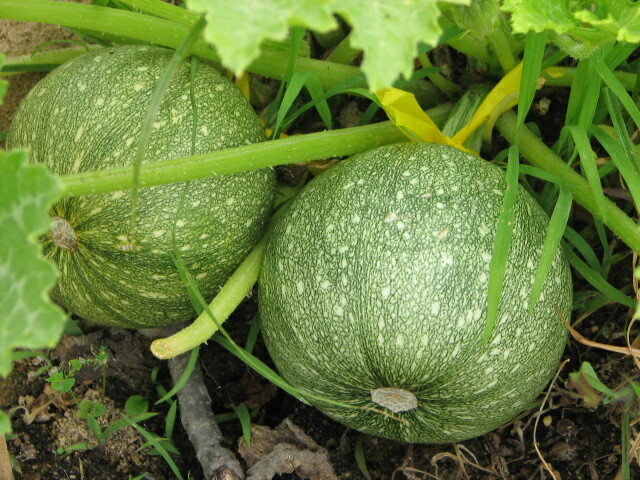 These round zucchini from the above plants have matured to form a tough pumpkin-like or gourd-like rind. You must leave them on the plant until their colors have changed and they develop that hard skin. It takes several weeks beyond the immature stage that we usually consume summer squash at for the squash to mature. These are on the porch where they will "after ripen", for an additional month. The after ripening gives the seeds an extra amount of time to gain food reserves which will allow for healthier, more vigorous seedlings and better germination. Then they will be split with a sledge hammer (yes, the can be tough), seeds will be scooped out, washed in a mild soap solution and thoroughly dried to the "breaking" stage before storage. We used to spread out the seed on newspaper to dry but now we use drying screens which provide better air circulation.